Electronic music producer Oli Freke has translated his love of synthesizers into a painstakingly-detailed timeline of their evolution between 1960 and 1995. 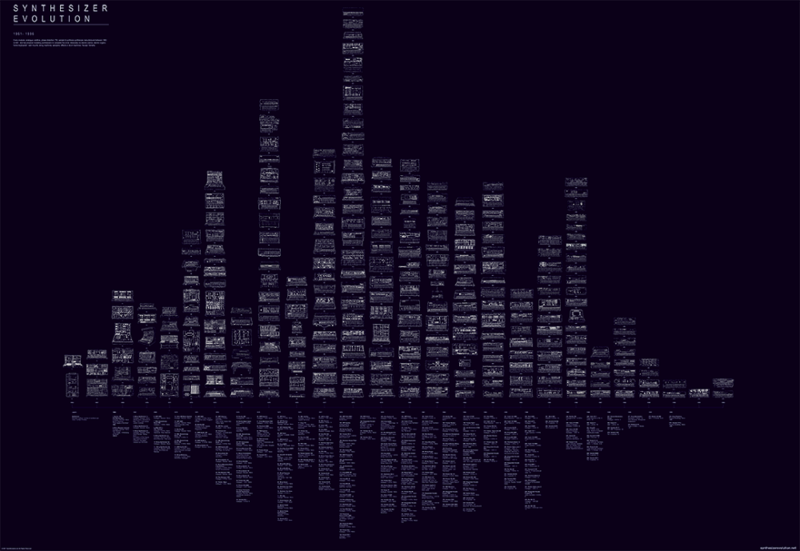 Over the last 18 months, he’s illustrated every production synthesizer produced to create Synth Evolution, an artwork showing the timeline of each synth in chronological order. We spoke to Oli about his love of synths and the results of the art project. I like the crazy one off synths like the Con Brio ADS 200 or the PPG Realiser - radical concepts that never really took off. First up, tell us about your history of synths. 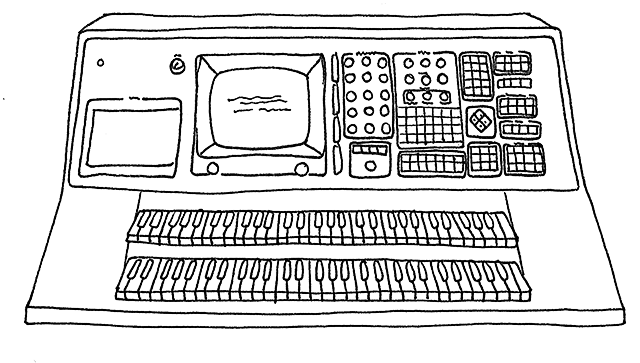 Can you remember the first synth you ever got excited about? It’s always been keyboard instruments for me - my grandmother had this weird instrument called a harmonium which is basically an organ that you had to pump with your feet to generate airflow to make the pipes sound. I used to play that for ages and float away in weird daydreams. It was probably oxygen deprivation from all the foot pumping now that I think about it. How did your love in synths develop from there? I also loved the music that was being made on synths, of course. As a child of the ‘80s, I was into Kraftwerk, Jarre, Vangelis, Tomita, all that stuff. As well as the classic electropop of early Depeche Mode, OMD, Human League, as well as maybe the less cool stuff, which my guitar loving school friends mocked me for. What was the first synth you ever played? Yamaha SK-1 - one of those tiny home keyboards, that a friend of mine had. It had an 8-bit sampler built-in - a massive 1.5 secs sampling time and everything. I actually have one now as another friend lent me one and doesn’t seem to want it back. Can’t think why! 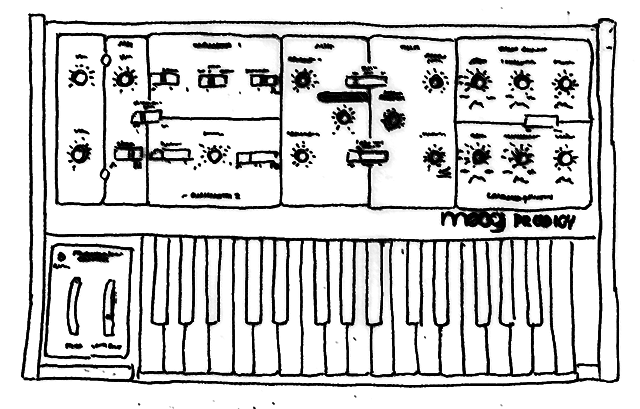 My first ever real synth was a half-working Moog Prodigy that my school basically gave me as they didn’t see the value in it Not when there were all these crappy Yamaha PSS-80 home keyboards with drum pads that all the other kids were way more excited by. I knew what the Moog really was, and my good friend Raphael got the Korg Minikorg 700s. Win win. Which are your favourite synth brands and why? I’ve always been a Moog and Roland man. Moog - because I have one, Roland because there’s just such an aura around their classic products - TB-303, TR-808, TR-909, Jupiter 8, Alpha-Juno, SH-101, D-50. They’re like magic talismans, just the names are evocative to a certain generation of keyboard players and responsible for such extraordinary music over the years. What is your favourite synth model? So many to choose from! I’m going to pick the near mythical Yamaha CS-80 - I’ve never played one or even been in the same room as one. But Vangelis used one on the Bladerunner soundtrack and I don’t think there’s been a better blend of the futuristic, the nostalgic and emotionally powerful in film music. They’re rare now as they weigh an absolute tonne and completely unreliable to actually run. Probably use half the energy of Ipswich to just power up too. Which synths do you own now? I don’t actually have too extensive a collection actually - it’s quite a pricey hobby! Like I say the Moog Prodigy is my pride and joy, and I’m really enjoying the the new Behringer Deepmind 12, their new 12 note true analogue polyphonic synth. It’s based on the Juno 60 (Roland again), and has a very nice sound. Good for sweet and lush chords, not so suited to extreme modular sound effects, in my opinion. So, ‘Synth Evolution’. Tell us about the concept. When did you come up with it? About 18 months ago - it’s taken that long to get it all done… labour of love indeed! How has it evolved since your first concept? My first impulse was to show how the size has changed from massive modular synths of the 60s and 70s down to small boxes by the late 80s. But that didn’t really work in the layout so had to sacrifice that in favour of telling the chronological story. I did the first batch, but I had to get help after all as I realised it would take me about 2 years to do them all myself! Any you’re particularly proud of? I like the crazy one off synths like the Con Brio ADS 200 or the PPG Realiser - radical concepts that never really took off. And the modular ones - the ones that look like telephone exchanges. I love those! And what are your hopes for this project? Just that it’s something that synth enthusiasts would love to have in their studios or homes. I find it really inspiring that these synths created the modern sound of music we have today; they revolutionised music as much as any historical instrument like the piano, organ or orchestra. Drum machines and samplers for sure. Definitely no organs, home keyboards, boring rack mount type boxes or fx. Synths, drums and samplers for the win! When can we next see you behind a synth on stage? I’m hoping to get back into music production in 2018 - gonna do some noisy techno I think. Watch this space! The Synth Evolution timeline poster (see below) and individually-illustrated synth mugs are available now from synthevolution.net.